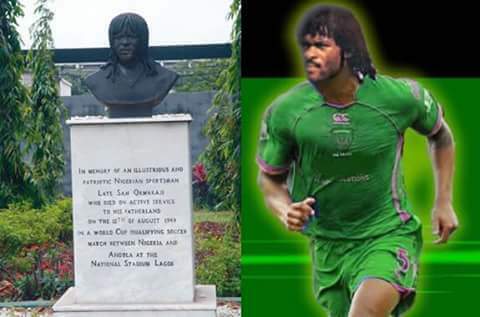 On Saturday 12 August, marked the 28th anniversary of football legend Samuel Sochukwuma Okwaraji’s tragic death. The dreadlocked Nigerian midfielder slumped and died on August 12, 1989 at the National Stadium, Lagos, during Nigeria’s World Cup qualifying March with Angola. The qualified lawyer, who had a masters in international law from the University of Rome, Okwaraji collapsed ten minutes from the end of the match and died from congestive heart failure. He was only 25. An autopsy showed that he had an enlarged heart and high blood pressure. Okwaraji also entered the record books as the fastest scorer at the 1988 Africa Cup of Nations, which was the only edition he featured. Some of the Super Eagles players of that era spoke to Sports Village Square to express their feelings about the player, who will forever be a national hero. Etim Esin, one of the Super Eagles players that day, recalled vividly the sad incident during a chat with Sports Village Square. “I don’t like remembering the sad incident. It was the worst game in my career. Okwaraji’s death remains one of the greatest shocks I ever got,” Esin said. “This is not a good episode for me to recount. Remember that apart from Okwaraji, there were some other deaths among the fans. I weep any time I remember August 12"